Autumn is the perfect season for exploration. Find out what we discovered at Pono this week! Swing your partner round and round! Alex Kramer brought his banjo and taught us how to square dance. We're ready for a hoe down! Autumn leaves are falling, and Dr. A explained how they get their beautiful colors. Ask us about chlorophyll the next time you're admiring the fall foliage! This week's cooking class with Dee Leconche featured lentil stew. No one could resist the aroma that filled our kitchen! This week children made thank-you cards and letters for Executive Chef Julian Alonzo, our wonderful mentor and guide at the New York Botanical Garden's Pine Tree Café and Hudson Garden Grill. After we returned from Randall's Island Urban Farm, Ali got out her accordion and led the children in singing about Old MacDonald and his famous farm. Who are these masked Pono friends? Ali and the youngest ones decorated their disguises. There's always something cooking at Pono! Pono friends share special moments every day. They laugh, read, play, and explore together! 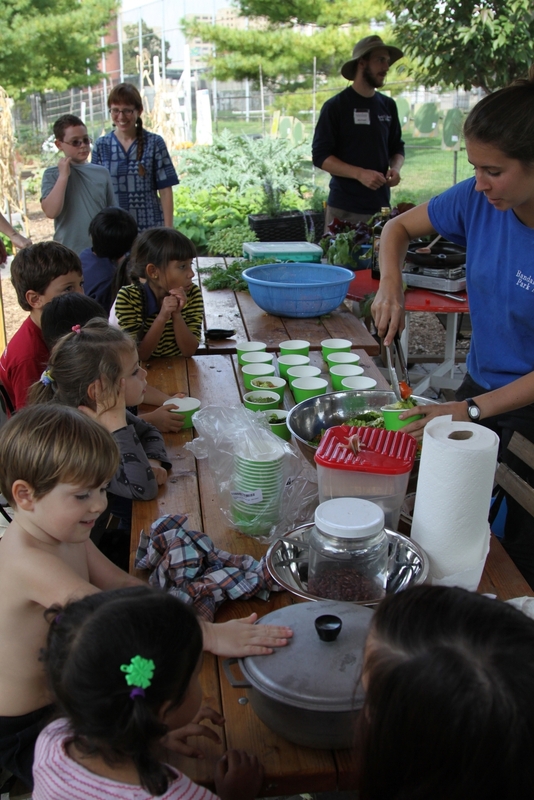 We had an authentic farm-to-table experience at Randall's Island Urban Farm! We harvested veggies and tossed them in a colorful salad that we enjoyed with lunch. And we still had time to pet the chickens! Thank you, Farmers Michael and Vanessa, for a beautiful day of discovery. On Wednesday we traveled to Wave Hill, where we enjoyed views of the Hudson River and Palisades, explored the lush gardens and beautiful grounds, and had an avian adventure. Thank you to our guide, Jonathan Billig, and to Bodi, Pono's resident bird expert, for helping us to identify and learn about our feathered friends. How exciting to spot a hawk, osprey, robins, and mockingbirds! Comic artist Magnolia Porter worked with the Friday Comic Book group on honing their illustrations, while jazz pianist and singer-songwriter Jesse Featherstone began a song writing class with another group of children. There is a lot of creativity in the air at Pono! Spread the word about Pono! Our next information session will be on Friday, October 30th, at 2pm. Join us to share your Pono experiences or invite a friend!